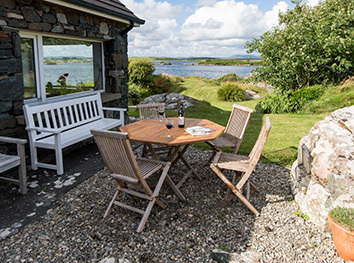 Maumeen Cottage provides rental accommodation in Galway, it is situated near Roundstone in the heart of Connemara. 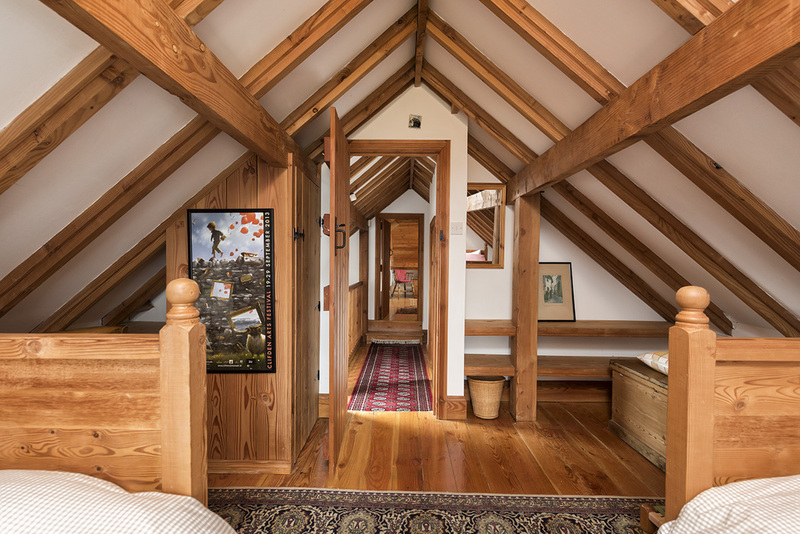 As a rental property for a holiday vacation, this stunning rental cottage is available for bookings nearly all year round. It nestles on the shore of Maumeen lake between the majestic Connemara mountains and the rugged Atlantic shoreline. 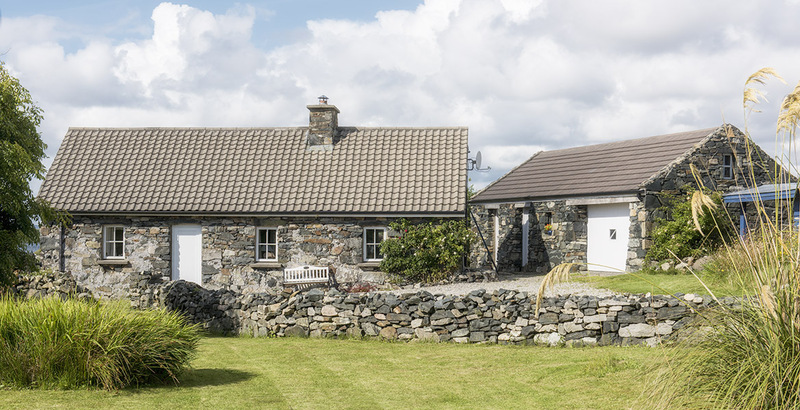 An attractive, romantic, traditional, Connemara stone cottage dating from 1843, renovated and extended to a high standard. 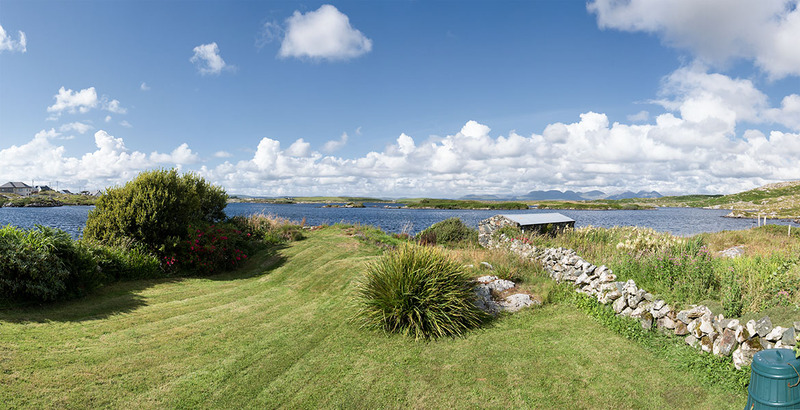 The cottage is ideally located in the West of Ireland, in central Connemara for visitors wishing to book a cottage holiday and discover the scenic beauty and magnificent Atlantic coastline. 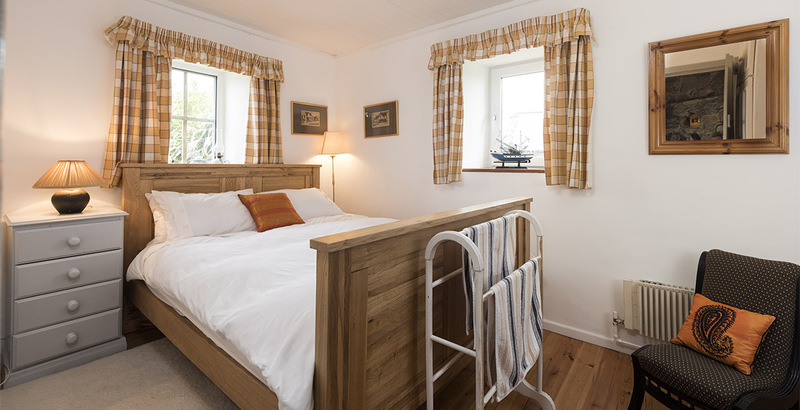 It is the perfect location in Connemara for a vacation, with three double bedrooms and a single bedroom, two bathrooms and a modern well equipped kitchen. 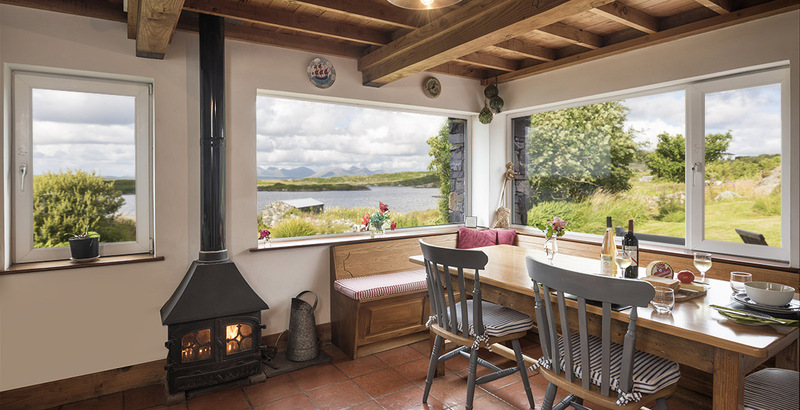 The cottage close to the sea is available for rent almost all year round and has stunning, unrivalled and uninterrupted views of Maumeen Lough and the Connemara mountains. Guests who have stayed at our Connemara cottage in the past, have praised the cottage for it location in the heart of Connemara and its suitability for small groups looking to stay in an Irish cottage in the west of Ireland. 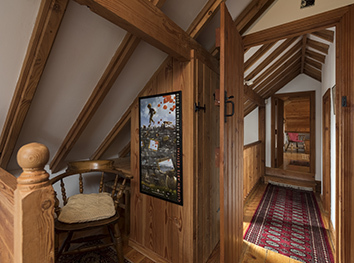 The cottage has an old world charm blending the old and new features beautifully whilst featuring a lot of timber. 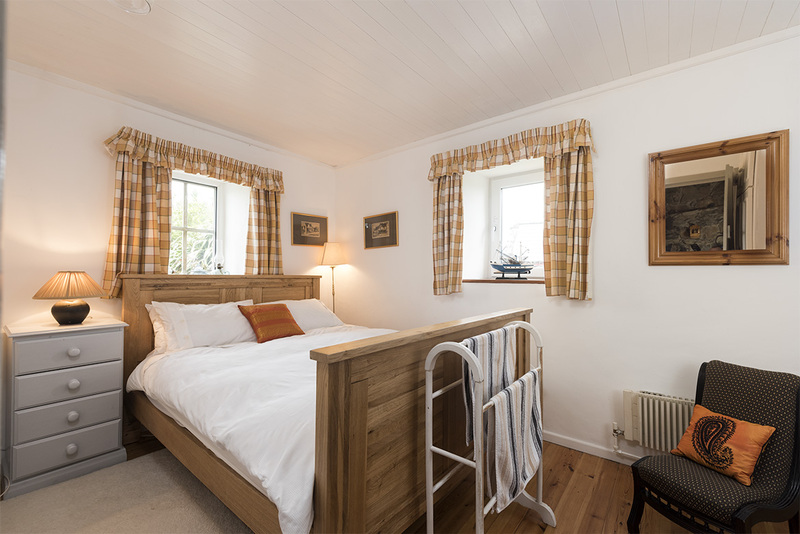 The secluded location and privacy make it a wonderful cottage experience for a family or a delightful romantic cottage escape for a couple seeking something different and exclusive. Three known proposals of marriage have taken place here. 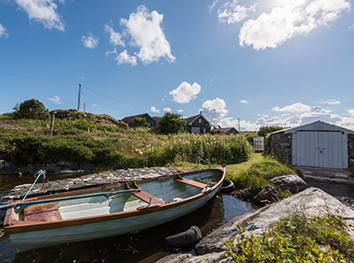 A retired sea captain’s Connemara cottage retreat on the Wild Atlantic way in an area where he spent the most wonderful and exciting Connemara family holidays dating back to his early childhood days. 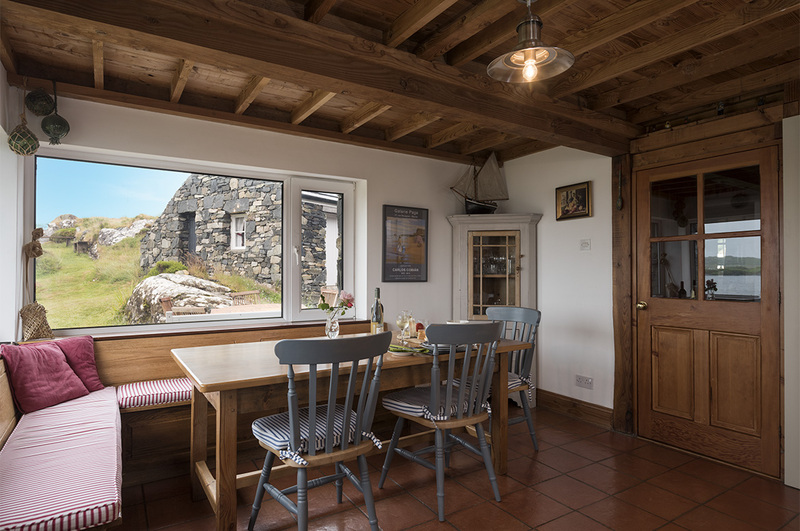 In this part of Connemara Maumeen Cottage offers a fantastic seaside holiday and a chance to escape into a tranquil, secluded and peaceful world where you can observe wild life varying from swans, otters, seals, mink and an abundance of birdlife. 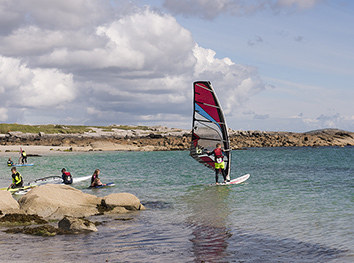 The great popular outdoor pursuits of scenic unspoiled Connemara are on the doorstep. 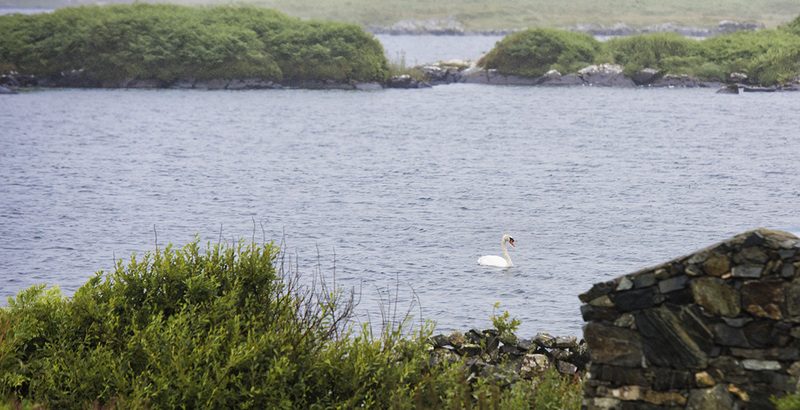 The Connemara wildlife can be closely observed from the cottage. Occasionally the otters will delight you when they dine on a caught fish at the end of the garden, or a Connemara shag dives into the lake to pull out a fish. Relish the view from the kitchen out to Maumeen lake as the occasional swan passes by. An idyllic location where the picturesque surroundings come right up to the property shore. 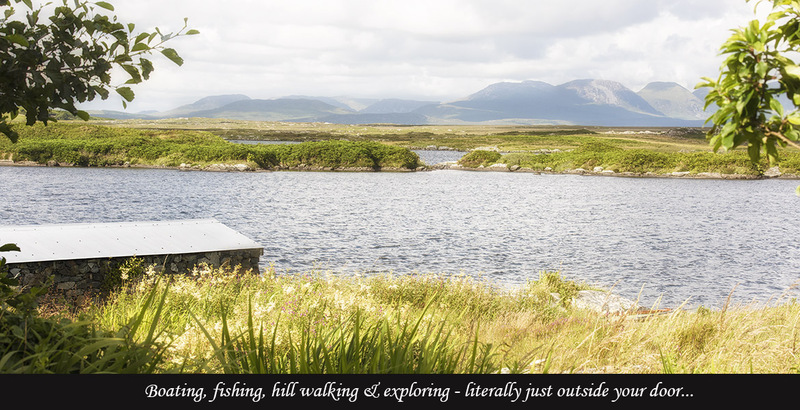 Having a boat available on a private pier at the end of the garden you could catch your own wild Connemara trout before breakfast. 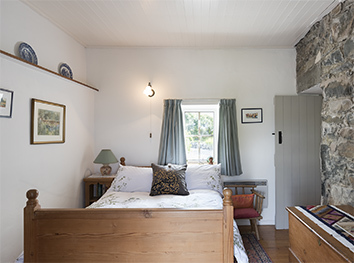 The bedrooms of this traditional Connemara stone built cottage offer a variety of beautiful tastefully furnished, cosy family friendly rooms. With a turf fire in the living room it is a wonderful place to relax read or watch TV, with the unique smell of Connemara turf glowing in the large open fireplace. 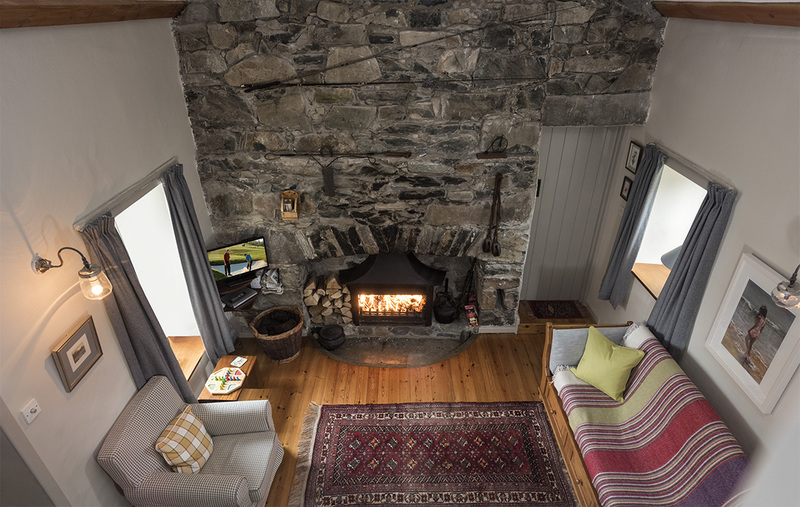 The cottage has the original large fireplace of 1843 that greets you with a warm welcome as you soak up the history of the house built during the Great Famine. 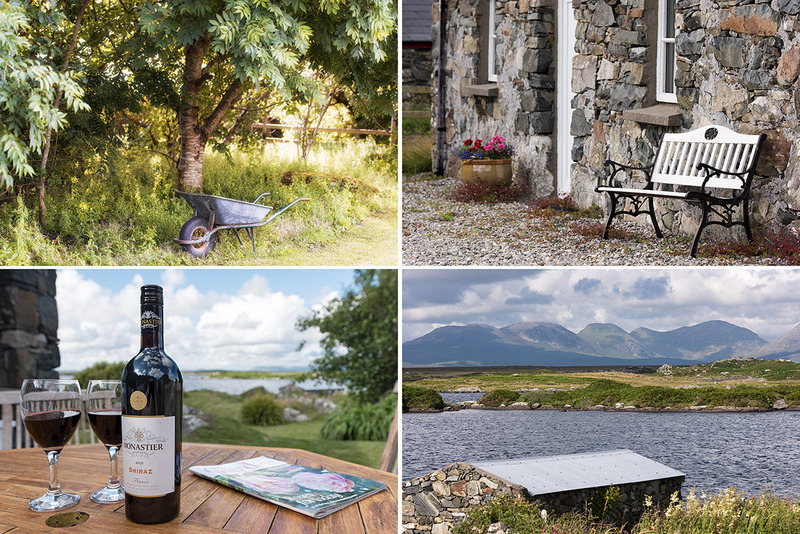 The cottage is the ideal rental cottage retreat in the heart of Connemara for couples or a family. The cottage has large very private well maintained gardens undulating to the boathouse and pier where a rowing boat is available for use. The natural landscape of Connemara is retained in the gardens where peace and tranquillity prevail. Visitors have proclaimed their holiday at Maumeen Cottage the best ever and they continue to return year after year. 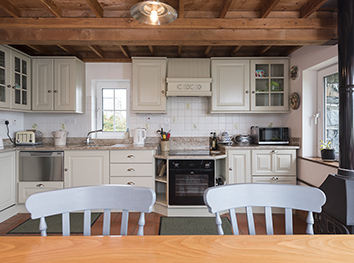 For fishing enthusiasts staying at Maumeen Cottage there are excellent Connemara salmon and seatrout fisheries at Ballynahinch, Delphi and the Erriff with Lough Corrib, Lough Mask and other fisheries nearby in other areas of Connemara. 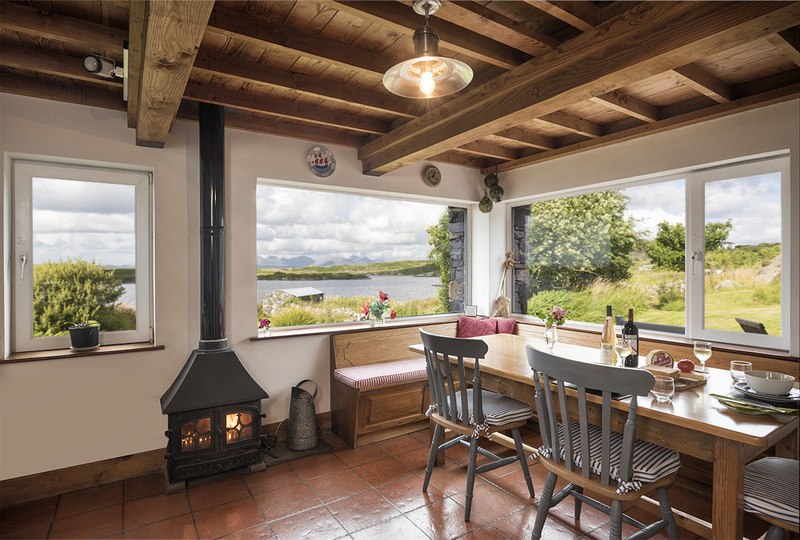 Visitors have marvelled at the views from the cottage dining table and have said they could sit for hours admiring the delightful Connemara landscape of lake, mountains and ever changing sky. Some visitors to Connemara have said they never wanted to move from the peace and tranquillity of the cottage and gardens. To sit on the Gin & Tonic seat above the cottage and watch the sun go down is a memorable experience as you wait for the offerings of the BBQ . 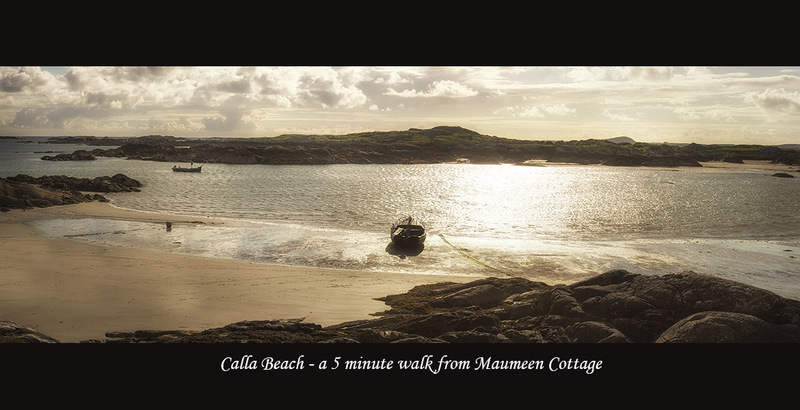 Maumeen Cottage offers an abundance of holiday activities nearby, from water sports at Gurteen Bay, golf on Connemara championship links course, horse-riding at Errisslanin, trout and salmon fishing, cycling, walking, mountain climbing and diving to name but a few. The sea and secluded beaches are but a short walk away. The nearby beaches of Dogs’Bay and Gurteen Bay are among the most beautiful, stunning and eye catching beaches along the Atlantic coastline of Connemara. Five miles from Maumeen Cottage is the picturesque village of Roundstone. It is arguably one of the most popular all year round seaside villages in Ireland. Roundstone with its small harbour, delightful pubs and some excellent restaurants offers the best of seafood. Sea fishing trips can be made from Roundstone harbour. Ten miles from Maumeen Cottage is the interesting town of Clifden made famous by Alcock and Brown the two intrepid airmen who made the first Trans-Atlantic flight in 1913 and landed in the Roundstone bog not far across the lake from Maumeen Cottage. The town has numerous good shops, hotels, guesthouses and some excellent pubs and restaurants.